Red Robin Gourmet Burger (RRGB) "Long-Term Review #13"
Sometimes I am absolutely dumbfounded by the mass of entries on this website. It is hard to believe that I have been blogging for almost five years not, since my first entry back in 2003. I encourage all of you to explore through the many entries on the blog as my own thinking has evolved and you may find many interesting ideas within the pages of this website. Some time back I started doing the 'look back one year' entries on weekends. Now, I am continuing my effort to start going way back to the beginning of the blog with reviews of the early stock picks. Not every one has turned out a winner, but there have been some very interesting stocks discussed here on this blog. On September 16, 2007, I reviewed Enzo Biochem (ENZ), the 12th entry to be written up on the blog. Let's take a look at the next entry, Red Robin Gourmet Burgers (RRGB) which I wrote up on May 23, 2003. TGIF. No not the restaurant but the day of the week! Terror alert up, unemployment up, volatility up. Anyhow, found this one this morning. Don't know much about it personally....and do not own any shares of this issue. According to Morningstar, Red Robing Gourmet Burgers, Inc., "is a chain of 184 casual restaurants, 87 of which are company owned and 97 of which are franchised". Sounds a little like the old Fuddruckers chain (anybody been in one of those lately?). The stock is grilling up pretty nicely today (sorry). Currently (10:15 am Central), stock is at $17.00 up $1.17 or 7.39% on the day. Yesterday they reported the first quarter of 2003 (reported 5/22/03), per the New York Times website, "Total Company revenues increased 17.3% to $92.9 million, Company-owned comparable restaurant sales (sort of like retail same store sales figures)...up 2.1%," and reported that per share income unchanged at about $.23. Annual revenue figures show steady increases from $115.7 million in 1997, 118.2 million in 1998, $130 million in 1999, $189.2 million in 2000 and $224.5 million in 2001, and $249.2 million in trailing twelve months per Morningstar. Balance sheet wise we find a bit too much debt on this issue to make me very excited and per Morningstar is not yet cash flow positive....so looking closely, a possible purchase....but for my picks....not one of the top choices on this page. Good luck investing....will see if we can find a better one later today! Bob"
Red Robin was "picked" on Stock Picks when it was trading at $17.00. RRGB closed at $44.33 on October 5, 2007, for a gain of $27.33 or 160.8% since posting. I do not have any shares nor do I have any options on this stock. Red Robin reported 2nd quarter 2007 results on August 16, 2007. For the quarter ended July 15, 2007, revenue climbed 31.5% to $178.6 million. GAAP diluted earnings per share dipped to $.29/share from $.43/share last year. Net income was $4.9 milion this year, down from $7.2 million last year. The company recorded multiple one-time expenses bringing down the earnings. The company missed expectations of analysts who had been expecting earnings of $.43/share on revenue of $175 million which the company was able to beat. Reviewing the Morningstar.com "5-Yr Restated" financials, we see that sales have continued to grow from 2002 through the TTM. Earnings, however, peaked at $1.80 in 2006 then dipped to $1.60/share in the TTM. Free cash flow has also been negative since 2004 with $(15) million in 2004, $(19) million in 2005, $(17) million in 2006 and $(4) million in the TTM. The balance sheet leaves a bit to be desired per Morningstar.com, with $17 million in cash and $25 million in other current assets compared to a current liabilities level of $90.1 million. This results in a current ratio of .47. I like to see current ratios of at least 1.25, to be considered 'healthy' from my perspective. In addition, Morningstar shows RRGB with an additional $175.7 million in long-term liabilities. 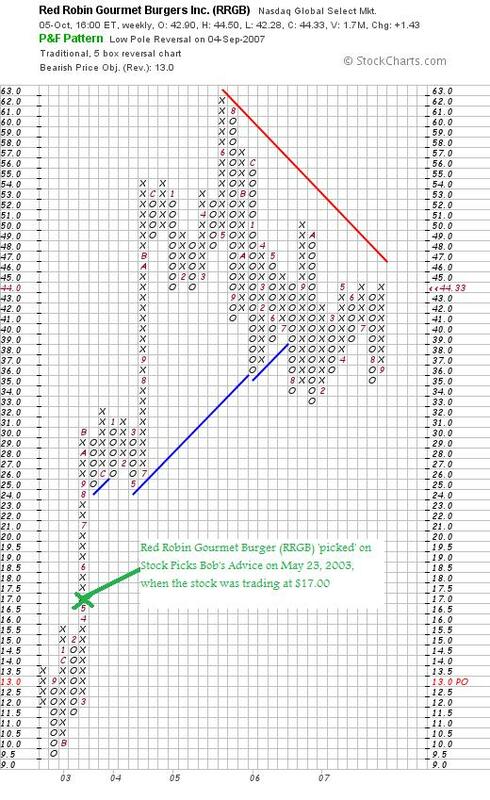 Looking at a "point & figure" chart on Red Robin Gourmet Burger (RRGB) from StockCharts.com, we can see the steep rise in price shortly after my stock pick was posted. The stock peaked in June, 2005, and then the stock price appears to have 'rolled over', with the stock breaking through support lines, and being unable to cross 'resistance lines'. Thanks so much for stopping by and visiting! If you have any comments or questions, please feel free to leave them on the blog. If you get a chance, drop by and visit my Stock Picks Podcast Website, where I have been discussing some of the stocks I have blogged about here on this website. In addition, be sure and visit my Covestor page where my actual trading portfolio is analyzed and ranked by the Covestor people. Also, visit my SocialPicks page where all of my stock picks from this year on have been reviewed and my 'picking performance' is evaluated. Have a great trading and investing week everyone, and try to stay healthy! Covance Inc. (CVD) "Weekend Trading Portfolio Analysis"
As one of my occasional weekend functions on the blog, I like to go through my actual holdings and review their performance and underlying fundamentals. Going alphabetically, I last reviewed Cerner (CERN) on September 2, 2007. Copart (CPRT) is actually next in line, but since it was a recent purchase, I shall move past that one to Covance (CVD) which I acquired 4/9/07 and currently own 119 shares. These shares were purchased at a price of $62.61. CVD closed at $78.68 on 10/5/07, for a gain of $16.07 or 25.7% since being acquired. At what price would I sell shares? On the upside, since I have yet to sell any shares, the first targeted sale would be at a 30% appreciation target or 1.30 x $62.61 = $81.39. At that point, my plan would be to sell 1/7th of 119 or 17 shares. On the downside, since I have yet to sell any shares on the upside, the (8)% loss would still be my targeted sale point or .92 x $62.61 = $57.60. At that point, all shares of my holding would be sold. Of course, I reserve the right to sell shares based on any fundamental information outstanding. On July 25, 2007, Covance reported 2nd quarter 2007 results. 'Net revenue' increased 13.7% to $381.1 million in 2007 from $335.2 million in the same quarter in 2006. Net income climbed 18.5% to $41.5 million from $35.0 million. On a diluted per share basis the increase was 18.9% to $.64/share from $.54/share in the same quarter in 2006. The company met expectations of analysts polled by Thomson Financial who had expected earnings of $.64/share but beat estimates on the revenue side coming in at $381.1 million when expectations were for $373 million. Checking the Morningstar.com "5-Yr Restated" financials on CVD, we can see that the steadily increasing revenue is intact, earnings are also continuing to steadily increase, and shares outstanding are fairly stable. Free cash flow while a bit erratic, has increased recently. Finally, the balance sheet is solid. Looking at the StockCharts.com "point & figure" chart on Covance, we can see a very strong upward move for this stock that started in July, 2003, when the stock moved strongly from $17 to $36 over a period of nine months. Since then the stock has steadily moved higher without even testing the support levels. Needless to say, I am still satisfied with the financial performance of the company. Hopefully with a bit of luck I shall be hitting my first stock sale on the upside and shall be entitled to purchase a new position! Thanks again for visiting my blog! If you have any comments or questions, please feel free to leave them right on the blog or email me at bobsadviceforstocks@lycos.com. If you get a chance, please feel free to visit my Stock Picks Podcast Website where I have been discussing a few of the same stocks I write up on the blog. In addition, don't forget the Covestor Page where my actual trading portfolio is monitored and its performance is recorded, and my SocialPicks page where my picks since the first of the year have been evaluated. If you still have time, consider visiting Prosper.com where if you sign up before the end of the year and enter into person-to-person loans you can also receive $25, (and I shall also receive credit for your registration!). If you do decide to make any loans, be sure to make small loans to a lot of borrowers to spread the risk which can be considerable. Be sure to investigate the entire process before proceeding. I currently have $200 out in loans of $50 each. I shall keep you posted on my success with this website. Thanks so much for all of your loyalty and for your visit here to my blog! I have been trying to accomplish several things simultaneously on this blog. First of all, this blog is about investing strategy--what to buy, when to buy, when to sell, and how much to buy and sell. At the same time, as part of my effort of learning the best way to do all of this, and as part of my own attempt at transparency, I have been sharing with you all of my transactions and holdings in my own trading account. For the last several months this information has been available on my Covestor Page, where Covestor tracks my trades and performance relative to the S&P and other investors. I would encourage you to visit and consider signing up on Covestor, a free service. If you need an "invitation" to join, email me at bobsadviceforstocks@lycos.com, as I have '5' invitations currently waiting to be given out. As of today, I am the #2 most followed investor on Covestor. If you choose to register and follow my trades, I shall continue to rank highly on this website. Another development this year has been my participation on the SocialPicks website. I would encourage you to visit my SocialPicks page where that website has been evaluating my stock picks without my input and determining how they have turned out, my % accuracy, performance, and the quality of my evaluations. You can check my 'ranking'. As of today, I am ranked #77 in the "top overall experts". More interesting, I am ranked as the #1 "top writer" on the SocialPicks website. I am glad that they appreciate my content :). That's enough 'tooting my own horn' for today! What I want to accomplish this morning before heading out with my inlaws for brunch is to review my current trading portfolio. My last review of my 'trading portfolio' was on August 19, 2007. Since then there have been a lot of changes. Instead of reviewing every trade (which is all present on the blog if you wish to reconstruct), let's get straight to my portfolio. Like the prior evaluation, these holdings are listed in alphabetical order followed by--symbol, number of shares, date of purchase, price of purchase, latest price (10/5/07), and percentage unrealized gain (or unrealized loss). Currently I am at 15 positions with 20 being my maximum. My equity value is $112,656.27, with $(48,312.85) in margin, giving my account net value at $64,343.42, up from $57,829.22 on 8/19/07. My margin equity percentage has dipped to 57.11% from 60.58% last evaluation. As of 10/7/07, I had $24,967.96 in unrealized gains in the account. Since the first of the year I have taken a net of $(43.07) in short-term gains and a net of $30,228.29 in long-term gains, for a net total realized gain this year of $30,185.22. I also have received total income of $362.50 and paid a total of $(3,797.99) in margin interrest paid. This has been a very good year for me, at least stock-wise. I hope that you all are doing well also! Please let me know if you have any further questions or comments by leaving them on the blog or emailing me at bobsadviceforstocks@lycos.com. I really should apologize to all of my regular readers! Last weekend I played 'hooky' and was unable to get it together and get a review of past stock selections up on the blog. This 'looking back one year' is starting to look like looking back 1 1/2 years...and pushing two! In any case, I shall try to get this post up today (or tomorrow :)). My reviews of past stock picks assume a buy and hold approach. It is simply easier for me to calculate past performance assuming an equal dollar amount of each stock 'picked' during a particular week was held indefinitely. As you may know, especially if you are a regular reader of the blog, I have a very disciplined trading strategy that involves selling losing stocks quickly and completely and selling gaining stocks slowly and partially at targeted appreciation levels. This difference in strategies would certainly affect the measured performance of these stocks in practice. During the week of April 10, 2006, although I had questions about other stocks like GameStop (GME), I only wrote up one stock, SanDisk (SNDK) which I "picked" on April 13, 2006, when the stock was trading at $61.95. SanDisk closed at $52.10 on October 5, 2007, for a loss of $(9.85) or (15.9)% since posting. On July 19, 2007, SanDisk reported 2nd quarter 2007 results. Revenue came in at $720 million, up 13% over the prior year. Net income was reported at $28 million or $.12/diluted share, sharply below the $96 million or $.47/diluted share in the same quarter in 2006. So how did I do during that week in April 10, 2006. 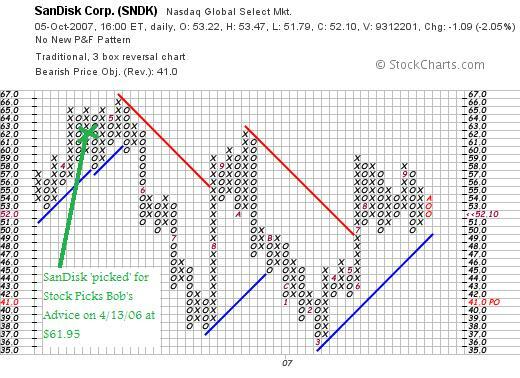 Well, my performance is based on the only stock 'picked' that week--SanDisk which declined (15.9)% since posting! I have certainly had better weeks. Ironically GameStop which was discussed in response to a question from a reader that weak far outperformed my own 'pick'. I have learned to listen and consider everything my readers write :). Thanks again for visiting my blog! If you have any comments or questions, please feel free to leave them on the blog or email me at bobsadviceforstocks@lycos.com. If you get a chance, be sure and visit my Stock Picks Podcast website, my Covestor page and my SocialPicks page! Hello Friends! Thanks so much for stopping by and visiting my blog, Stock Picks Bob's Advice! As always, please remember that I am an amateur investor, so please remember to consult with your professional investment advisers prior to making any investment decisions based on information on this website! I have had a busy week and every time I meant to get around to writing up a stock, I had something else I needed to do or it was simply so late in the evening that I needed to get some shut-eye. I did manage to make some changes in my portfolio and shall expand on those ideas at a future date. In any case, excuses aside, I really wanted to take a look at the list of top % gainers from yesterday and see if there was a stock that fit my criteria for the blog. A few days ago, I started to write up Systemax (SYX) but didn't finish the entry. Now with Systemax making the top % gainers list from the NYSE again yesterday, I thought I would expand on this investment idea. I do not own any shares nor do I have any options in this stock. Systemax closed at $23.25 on October 5, 2007, for a gain of $1.81 or 8.44% on the day. Let's take a closer look at this stock and I will explain why I believe it fits what I am looking for in a stock and why it deserves a spot in my 'vocabulary' of investing! "...and its subsidiaries operate as a direct marketer of brand name and private label products. 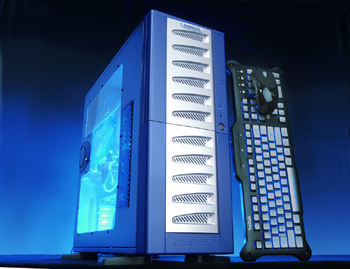 It operates in three segments: Technology Products, Industrial Products, and Hosted Software. The Technology Products segment sells computers, computer supplies, and consumer electronics in North America and Europe....The Industrial Products segment sells various material handling equipment, storage equipment, and consumable industrial items in North America....The Hosted Software segment markets PCS ProfitCenter Software, a Web-based application, which delivers on-demand service over the Internet. Its product helps companies automate and manage the customer life-cycle across multiple sales channels." On August 8, 2007, Systemax (SYX) announced 2nd quarter 2007 results. For the quarter ended June 30, 2007, sales increased 18% to $647 million from $547 million in the same quarter in 2006. Net income came in at $18.3 million, up 94% from $7.1 million or $.37/diluted share, up from $.19/diluted share last year. Reviewing the Morningstar.com "5-Yr Restated" financials on Systemax, we can see a steady picture of revenue growth with sales increasing from $1.55 billion in 2002 to $2.35 billion in 2006 and $2.55 billion in the trailing twelve months (TTM). Earnings have improved from a loss of $(1.70) in 2002 to $.10/share in 2003. These were flat between 2004 and 2005 at $.30/share, but improved to $1.20/share in 2006 and $1.30/share in the TTM. Outstanding shares have been very stable with 34 million in 2003 increasing only to 35 million in the TTM. Free cash flow has been positive and growing nicely recently with $4 million in 2004 increasing to $28 million in 2006 and $94 million in the TTM. The balance sheet on Morningstar.com also appears quite strong to me with $82 million in cash and $456.0 million in other current assets. This total of $538 million, when compared to the current liabilities of $307.2 million yields a current ratio of 1.75. The company has a relatively insignificant level of long-term liabilities reported at $6.4 million. Examining the Yahoo "Key Statistics" on Systemax (SYX), we can see that this company is a small cap stock with a market capitalization of $838.2 million. The trailing p/e is a reasonable (imho) 18.08. Apparently there aren't any analysts following this stock as we don't have a forward p/e, or a PEG ratio. I would expect this company to be picked up by some analysts and reported by Yahoo in the future if it continues to perform as strongly as it is currently. Using the Fidelity.com eresearch website, we can see that valuation-wise the company is also pretty reasonably priced with a Price/Sales (TTM) ratio of 0.33, compared to the industry average of 2.85. The company does not do quite as well in terms of profitability, at least as measured by the Return on Equity (TTM) with the company coming in at 17.09%, compared to the industry average of 38.08%. Returning to the Yahoo evaluation, we see that there are 36.05 million shares outstanding with 19.46 million that float. There are 4.26 million shares out short as of 9/11/07, yielding a short ratio of 11.9 days. I use my own idiosyncratic '3-day rule' for significance, and this represents quite a few shares out short, setting up for a possible short squeeze. No dividend is paid and no stock splits are reported on Yahoo. 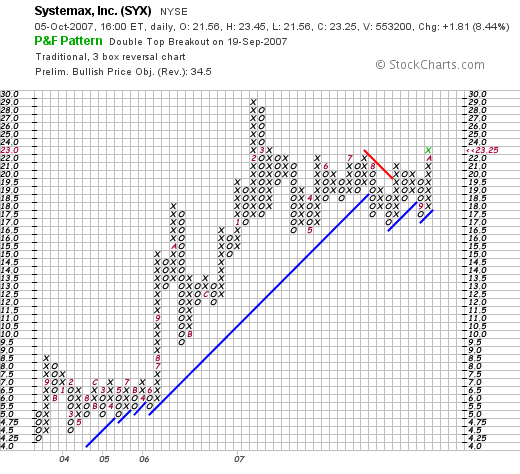 Examining the "point & figure" chart on Systemax (SYX) from StockCharts.com, we can see a sharp rise in stock price between June, 2006 and February, 2007, when the stock rose from $6.50 to $29. The stock has been consolidating since and appears to be forming a sort of "flag formation", which might suggest an upside potential as the stock consolidates at this higher level. 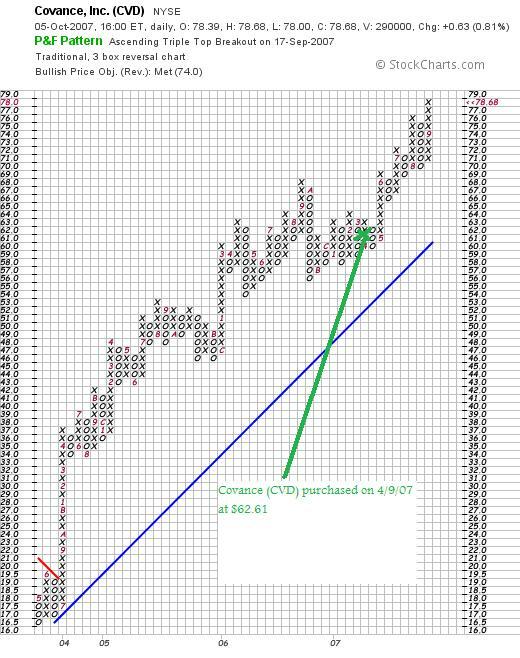 I am not a technician and generally 'flag formations' are not associated with point and figure charting, but the stock chart looks reasonably positive to me with little evidence of the stock getting overpriced imho. Well, needless to say I like this stock! Let's review a few of the things that make the stock attractive for inclusion in this blog. First of all, the stock made a strong move higher in an otherwise strong market. The latest quarterly report was superb with strong revenue growth and even stronger earnings report. Longer-term, this company has moved from losses to profits with generally steadily increasing earnings and stable outstanding shares. Free cash flow has been positive and growing very strongly. The balance sheet is solid with almost not long-term debt. Valuation-wise, the p/e is in the teens. Unfortunately (or fortunately) there are no analysts that I can easily find making estimates for the stock. As analysts discover this company (?) if the company continues to do well, this would only bode well for investors at this time. (my guess?) To top it off there appears to be a significant number of short sellers who are betting against this company. Finally the chart doesn't look bad. Valuation-wise, the price/sales is solid but the return on equity is a tad anemic. On balance, things look bright for this company and if the company can indeed come in with another strong quarterly report, well....let's just see what happens. I don't own any shares, but if I were buying shares....well this is the kind of company I would be purchasing! Meanwhile, I shall throw it in the "hopper" of my stocks, my so-called vocabulary of investing :). Thanks again for dropping by! If you have any comments or questions, please feel free to leave them on the blog or email me at bobsadviceforstocks@lycos.com. If you get a chance, be sure and drop by my Stock Picks Podcast Page, where you can hear me discuss some of the many stocks written up on the blog. Also, be sure and visit my Covestor Page where my actual trading portfolio is evaluated, reviewed, and compared to other investors who have registered on this website. Also, don't forget visiting my SocialPicks Page where ALL of my stock picks are reviewed, whether or not I own them (! ), at least since about January of this year. (the blog goes all the way back to 2003!). Finally, you really ought to check out Prosper.com, where I currently am trying out the person-to-person lending program. Full disclosure, when you sign up I earn $25 if you make a loan and YOU get $25 as well when you open an account to lend money. Be sure you are aware of the extensive risks with this venture. So do this in small amounts and be careful as you can lose money on these loans! But Prosper is a fascinating program and represents what is new on the Web! Quality Systems (QSII) and Immucor (BLUD) "Trading Transparency"
As I have written about previously, I am now being tracked by Covestor. You can visit my Covestor Page and note my own trading account performance. One of the uses of Covestor has been to help me identify the weaker stocks within my own portfolio. Quality Systems (QSII) has been one of my top performing stocks in my entire portfolio. However, it has been lagging as of late. Since I was making a 'swap' on my own judgment, I purchased 154 shares of Immucor (BLUD) at $37.9499 shortly after my QSII sale. These sales and purchase are not strictly within my own trading rules. But since there appeared to be fundamental issues with QSII, and indeed the stock was lagging the rest of my portfolio, I decided it was a reasonable move. My only other stock at the present time that seems to be lagging is ResMed. However, ResMed, I believe, is involved in a temporary recall that is adversely affecting sales/profits. I will try to sit tight with that one for now. Thanks so much for stopping by and visiting my blog! If you have any comments or questions, please feel free to leave them on the blog or email me at bobsadviceforstocks@lycos.com. In the last week I have chosen to 'swap out' of a couple of my holdings into stocks that I believe have greater potential, at least over the intermediate term. There isn't really anything wrong with Starbucks, or Coach. These are classic growth stocks and classic Peter Lynch kind of stocks with a great, understandable product and steady growth in revenue and numbers. It is just that I sense a certain fatigue in their performance. As if they have grown quickly and need to rest awhile before moving once again to higher levels. Today, with the market charging higher, and Coach literally dragging, I chose to sell this stock and look on the top % gainers list for another pick. Apogee Enterprises (APOG) a stock that I recently wrote up has been having a nice day today, and as I write, is trading at $27.34, up $1.40 or 5.4% on the day. Earlier it was on the top % gainers list of the NASDAQ. Looking for a replacement for my Coach position, I purchased 280 shares of APOG at $27.53 in my account. Time will tell whether this was a wise move. It would be interesting to hear from some of you readers about this particular swap. Would you have done this? What about Starbucks? What about all of the trading rules? I think it was the right decision. Wish me luck! If you have any comments or questions, please feel free to leave them on the blog or email me at bobsadviceforstocks@lycos.com. A few moments ago, on my own arbitrary decision (I always reserve the right to make these! ), I sold my remaining 61 shares of Coach (COH) at $46.25. Coach has been under pressure recently. Much like Starbucks it is a phenomenal success story. However, with my own sale of shares, I am reducing my rating on the stock. Mostly, ever since Hank Greenberg wrote his column on August 26, 2007 on the possible challenges facing Coach, the stock has struggled to regain momentum. I think that once Coach demonstrates that it shall continue to post strong same store sales number and great quarterly results, the upward move of this stock shall resume. I do not believe the Coach story is over. However, there are so many other intriguing stocks on the horizon. And with Coach stock down today while the market was moving strongly higher, I chose to 'pull the plug' on my remaining shares which actually are a very small position for me. I actually purchased my original shares of Coach (COH) at a cost basis of $8.33 on February 25, 2003, just before starting this weblog. Thus, the shares sold today were sold at a gain of $37.92 or 455.2% since purchase. It has indeed been a great investment for me! I shall need to be cautious with these arbitrary moves like my sale of Starbucks. But I believe that if I can mainly stick with my investment strategy and use a little of my own thinking on these holdings, I shall be the better for it. It isn't exactly along the line of rules, but one of the problems facing me is the judgment of perhaps selling stocks which have made very large gains which do not fall to sale points yet appear to be struggling at least in the intermediate term. Time will tell if this was a good decision. As time will also reveal whether selling Starbucks was wise. I didn't waste any time with that 'nickel'! Since I just sold a portion of my PCP stock at a targeted gain, this generated the 'internal signal' as I call it, giving me the 'permission slip' to add a new position. And I didn't waste any time! Looking through the list of top % gainers on the NYSE today, I came across IHS, an old favorite of mine, currrently, as I write, trading at $58.69, up $2.37 or 4.20% on the day. I am giving IHS another shot. This is an old favorite of mine, having written up this stock on March 24, 2007, and also having had shares for a brief time before hitting a loss and selling them. As I have indicated before, I am almost always willing to revisit past stock picks and past stock purchases for consideration if all of the factors are present. Sort of like having the planets aligned in some astrological sense :). In any case, I purchased 140 shares of IHS at $58.45. Wish me luck. I shall try to give a quick update on this stock. Meanwhile, you can visit my March 24, 2007 post, for a review at least at that date. Precision Castparts (PCP) "Trading Transparency"
A few moments ago I sold 10 shares of my Precision Castparts (PCP) stock at $151.79. This was 1/7th of my position of 74 shares. I now have 64 shares in my trading account. This is my 4th partial sale of PCP which has been an outstanding investment for me which was acquired at a cost basis of $69.05 on 10/24/06. Thus, on these particular shares, I had a gain of $82.74 or 119.8% since purchase. This was a sale at the 120% appreciation level, with my targeted sales being at 30, 60, 90, 120%. On the upside, my next partial sale would be at a 180% appreciation level or 2.8 x $69.05 = $193.04. On the downside, my targeted sale would be at 1/2 of this 120% appreciation level or at a 60% appreciation target. This works out to 1.6 x $69.05 = $110.48. Since I am under my 20 position maximum (at 14 positions), this gives me a "permission slip" to add a new position. As I like to say, 'that nickel is burning a hole in my pocket already!'. I shall be scanning the top % gainers list today and see if there is anything that meets my requirements. I shall keep you posted!